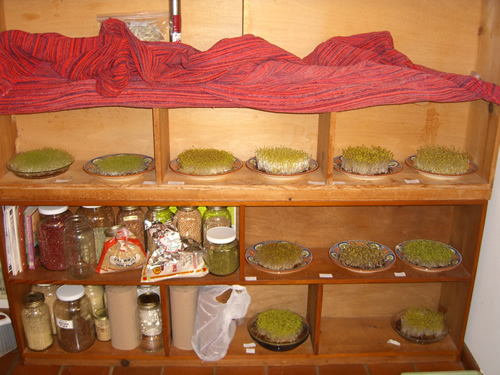 Now, part two of the sprouting series inspired by Amma's words. 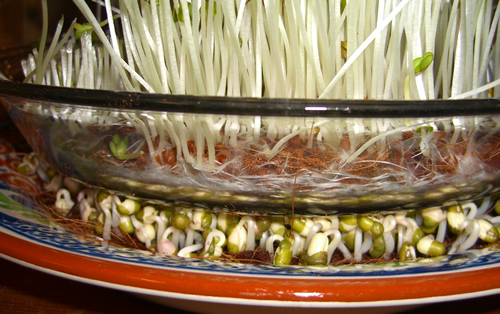 Last time, we explained how to sprout the easy sprouts such as mung and lentil beans. So, this time we move into the smaller and harder to sprout seeds. 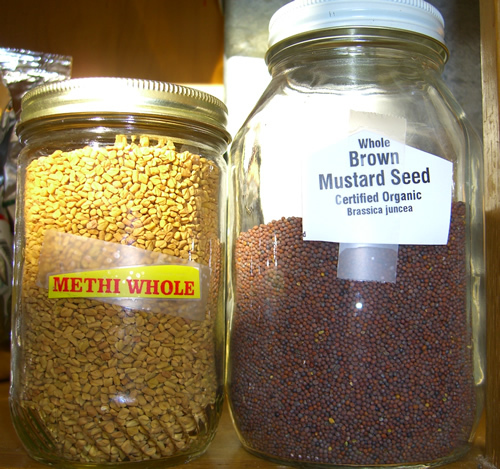 We have sprouted alfalfa, broccoli, red clover, fenugreek (methi), mustard, radish, chia, and flax as described below. 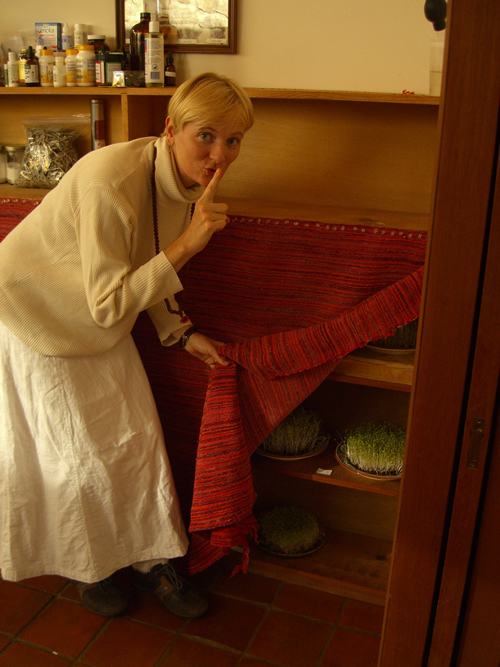 For some reason cumin seeds did not work for us. We tried peas and urad dal but they were better using the jar method. alfalfa, broccoli, red clover, fenugreek, mustard, radish. Wet the growing medium (coconut husk) from the center. The seeds need to be saturated but not left in standing water. 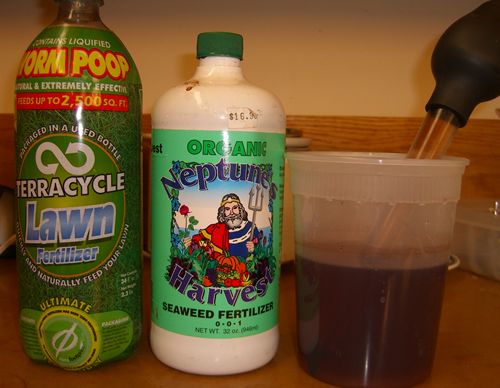 Use a growing nutrient if you like. 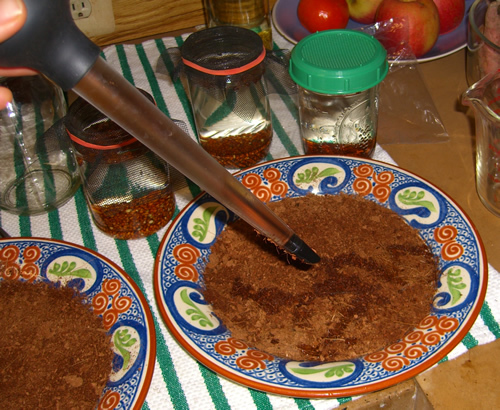 Spread the seeds evenly over the prepared turf. 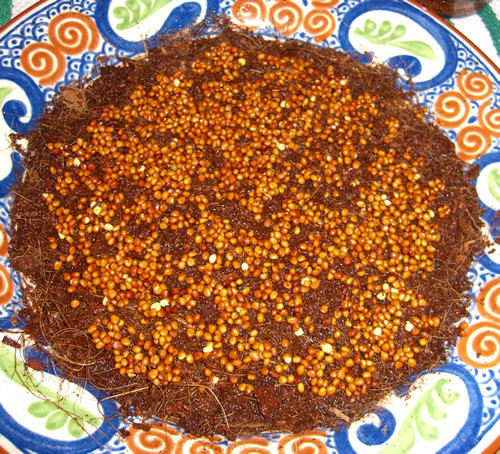 The seeds can touch each other but should not be on top of each other. It is radish you see in the picture to the left. We use bookshelves in the kitchen as the growing area. During the day, a cover keeps the area dark, forcing the sprouts to grow taller. An overturned cardboard box also works well. At night, we ventilate to prevent mold from growing. 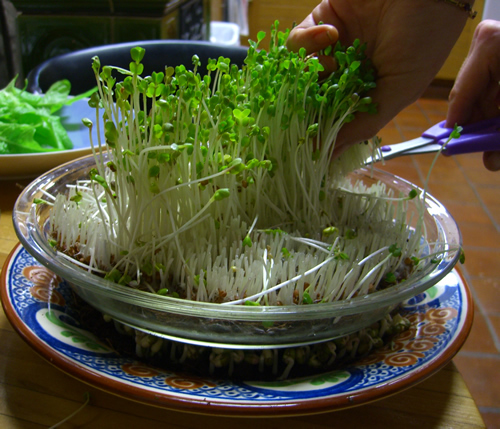 Use pie plates or dinner dishes for 2-3 days to strengthen sprout shafts. Water as needed. The edges will dry out first and this indicates the time to water. Turkey basters work well. The height will vary according to the type of seed sprouted. Place in the light the day before eating in order to green the tips. 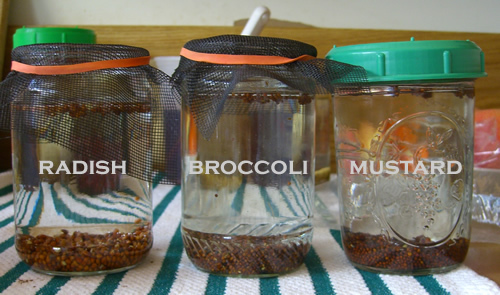 Allow 7-9 days for sprouts to become ready for eating. Then, harvest by cutting tops with scissors. 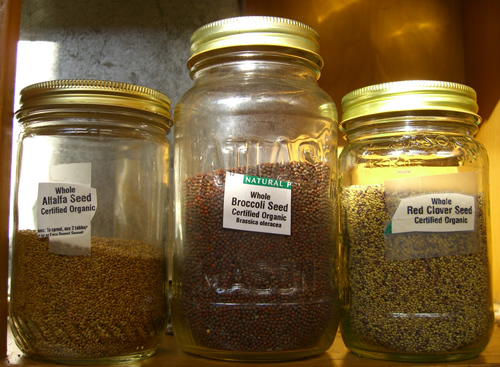 These seeds can also be sprouted in jars, but they will tend to get moldy unless only a small number of seeds are sprouted at a time.